When Jesus told the disciples that He was about to leave them and return to the Father, fear filled their hearts. Yet He also gave them words of comfort and assurance; words that still inspire and bless us today. 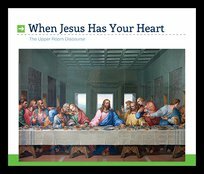 In fact, the most cherished passage in the Bible is known as the "Upper Room Discourse" where Jesus intimately shares His heart with His loved ones.